Featuring Jay Rambo white cabinetry, the glass-front cabinets are perfect to display your glassware and bottles of bourbon and are illuminated by LED lights! 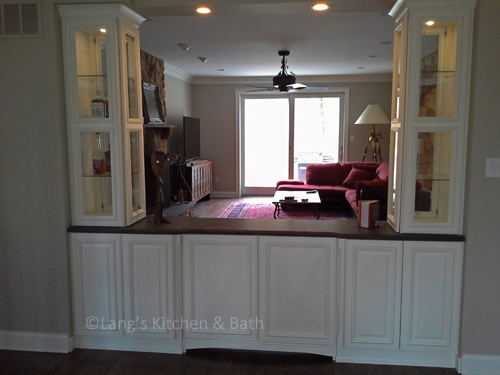 This home bar is specially designed for the bourbon connoisseur. Featuring Jay Rambo white cabinetry, the glass front cabinets are perfect to display your best glassware and bottles of bourbon and are illuminated by LED lights on the bar. The bar is open to both the family room and piano room and is sure to be the center of social gatherings.